Veritas Soap Co. Lip Balms last so unbelievably long! Our Lip Balms are pigmented with Organic fruits, oxides & vegetable powders. 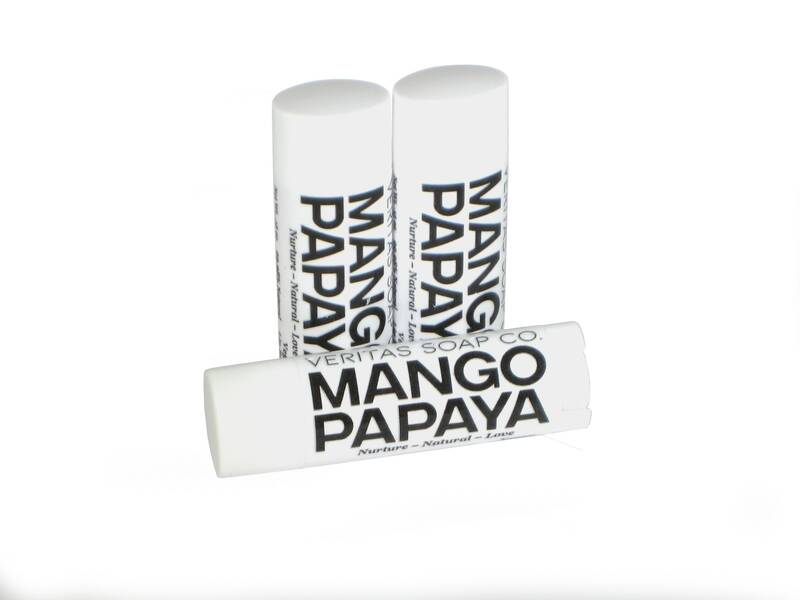 MANGO PAPAYA LIP BALM - This fruity lip balm tastes so good! Made with Organic Mango and Papaya juice to exfoliate the lips slowly & naturally. These fabulous fruits contain Vitamins A and C, which have been shown to help repair and tighten the skin and lighten age spots. This lip balm is sweetened with organic Stevia. INGREDIENTS: Mango Butter, organic Coconut oil, organic Non-GMO Jojoba oil, organic Olive Oil, Candelilla Wax, Carnauba Wax, organic Mango Juice/Puree, organic Papaya Juice/Puree, organic Stevia, Vitamin-E, organic Turmeric & less than 1% of the following (oxides & flavoring oil). My favorite chapstick/lip balm/shine serum for lips/etc. I love it-many went to friends as gifts. Thank you for making this! And the wonderful samples. Will definitely be coming back. Purchased this along with bath bombs & soap, every transaction I've had with Veritas Soap has been wonderful! This is the only 'chap stick' I have found that works great and does not contain bees wax (dries out my lips). Will definitely be getting more! The flavor, the smell, the way it feels, perfect! !